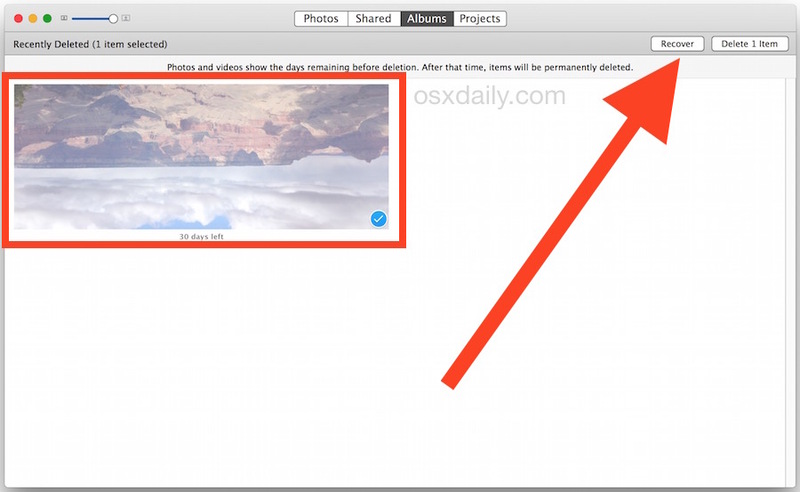 Users managing a Photos app library on the Mac have almost certainly deleted a picture, video, if not dozens of them. Sometimes this is intentional, sometimes it’s accidental, and sometimes it’s regretful, and perhaps later, a user wishes they could recover those deleted pictures. If you find yourself in that situation, then you may be able to recover the deleted images with the help of a Photos app recovery feature, without even having to turn to backups from Time Machine in OS X.
Recovering deleted pictures from Photos app in OS X is very easy, but there are a few limitations that are in place which could prevent an image or movie file from being restore through the app itself. You can repeat this as often as necessary to recover deleted pictures in Photos app. You will notice that image thumbnails have a timer of sorts underneath them, indicating the amount of time that is left before the picture is completely removed from Photos app – this is also the grace period that the user has and is allowed to recover the pictures without having to turn to a separate Time Machine backup or whatever other alternate backup method the Mac user has. The limitations for Photos recovery are basically how much time has elapsed since the image(s) were deleted, and how much disk space is available on the Mac. Images will delete themselves permanently after 30 days from the initial removal, and if the available disk space is basically nil then images will be deleted quicker as well. And yes, this works to recover images that have been removed from an imported iPhoto or Aperture library as well, though the image must have been deleted from within Photos app – it’s not able to restore pictures from other apps. This can greatly help manage libraries, though for many users with complex image libraries, it can sometimes be best to make a new and different Photos library for different purposes, say for work or for personal. Do note that that the recovery option is library dependent as well, so if you juggle multiple libraries you’ll want to switch to the library that the photo or video was deleted from in order to recover it. This works in Photos for OS X much like Photos in iOS, which has a similar photo recovery function on iPhone and iPad that is also time sensitive. It’s also worth pointing out that if you just want to access the image file but you don’t want to restore it into the Photos library, you can also use the various tricks to access image files in Finder mentioned here to get to the actual document on the Mac hard drive. Finally, if Photos app doesn’t find the files to recover, you can sometimes turn to third party solutions like this, but if much time has passed, you may be out of luck. It’s worth a try, though. Cheers for the tip, this was just what i was looking for! 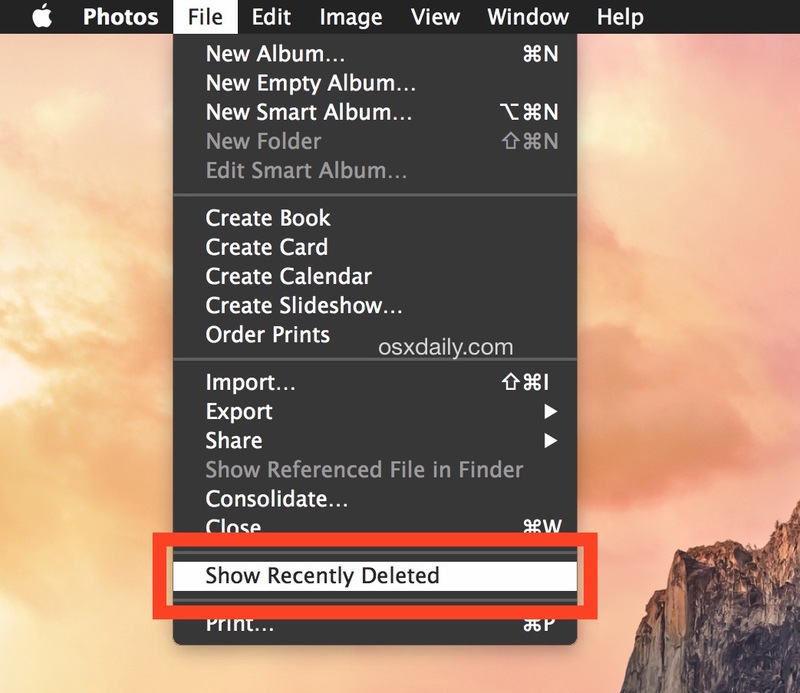 I am using OS X ElCapitan and I do not have “Show Recently Deleted” on the file menu in the photos app. What should I do? I have the same problem. Did you find out how to fix it? I had the same issue and have a Macair. Spent close to an hour to understand. Hope this saves you time. In that there will be a recently deleted option. I took a photo on my iPhone 4s and used it for a profile picture on a dating site called plenty of fish. I recycled the phone. I would like to retrieve the photo because I’m making a scrapbook or me and my significant other. I should mention the photo was taken over two years ago. Is there a way I can recover the files I have accidentally deleted permanently?